Print this list of transition words. Transition words serve an important function in your writing, making it easy for the reader's attention to move with you from topic to topic. 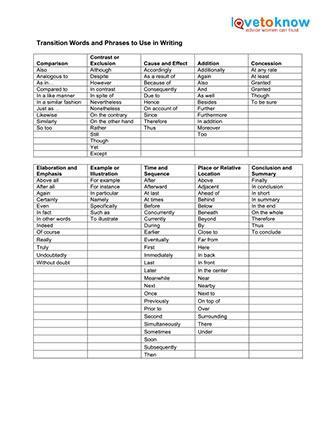 Increasing your vocabulary of these words can help you be more articulate and give you greater flexibility as you write anything from persuasive essays to short stories or novels. Transitions are points in your writing where you move from one topic or setting to another. Because transitions can take many forms, it helps to classify these words according to their use. It's useful to print out this list of transition words and keep it handy as you write. Transitions do more than keep your writing from sounding choppy and unprofessional; they send important signals to your reader. Using these words can help you keep your reader's attention and ensure that he or she fully understands your work. Ultimately, these words help you fulfill your job as a writer.